Mallory Hoff has details on an extensive face transplant for a badly burned volunteer firefighter. He has received the face of a Brooklyn cyclist in a remarkable transplant carried out in Manhattan at the NYU Langone Medical Center. The bike rider died in an accident in July, and it took over 12 hours to make his face, the new face for 41-year-old Patrick Hardison. His doctors warned him that the procedure was so risky that he had only a 50/50 chance of surviving it. But it was a risk he was willing to take. "I prayed daily that there would be a miracle to help me get through this, and you know, it's all in God's timing," Hardison said. 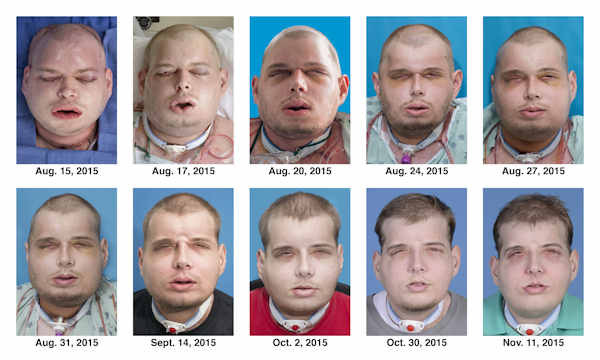 This combination of photos from Aug. 15, 2015, to Nov. 11, 2015, provided by the hospital shows the recuperation of Hardison after his facial transplant surgery. The surgery has paved the way for him to regain normal vision, and in an interview last week, he said that will let him accomplish a major goal: "I'll start driving again." "The procurement of the face took approximately 12 hours, the preparation of Patrick's face took approximately eight hours," said Rodriguez. "The face was brought from the donor room to the recipient room. This was a well-synchronized, executed procedure, one that we had rehearsed for so many times." The transplant cost between $800,000 and $1 million and was paid for by medical center grant money.